The Hindenburg was unique in that it was "the world's first flying hotel" - built for long distance travel. It traveled from Germany, across the ocean, and to the United States in 1937. (Just the fact that it made this journey in 1937 is intriguing to me, given the state of Germany at that time and the approaching second World War.) As the Hindenburg attempted it's landing (on U.S. soil) it exploded. There were thirty-six passengers and sixty-one crew members on board. Of those numbers, sixty-two people survived the 37-second blaze. Surviving the Hindenburg tells the story of the Hindenburg through the eyes of one of the surviving passengers, fourteen year old crew member, Werner Franz. Franz's story is told in this new picture book which was released last month by Sleeping Bear Press. I love that this particular publishing company releases so many history-based stories in a form which makes history accessible to young readers. 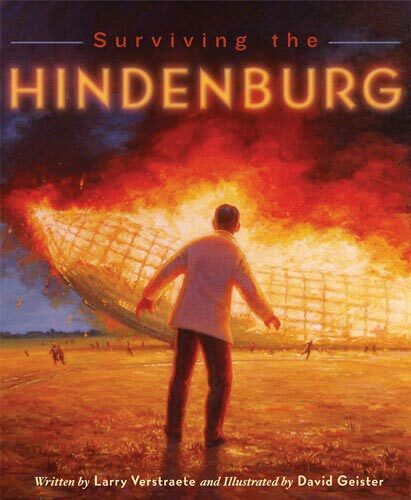 Surviving the Hindenburg very clearly explains what a zeppelin was, who Werner Franz was and why his escape from this fiery disaster is so very remarkable. This is quite the interesting story! This book make me want to look up additional information on both the Hindenburg and Franz. Here is an interesting article about Werner Franz. Here is a horrifying and emotional video, showing live footage of the disaster. The news broadcaster describing the event is named Herbert Morrison. In my opinion, this is another winner from Sleeping Bear Press and I thank them for sending a copy my way! No, I don't think I'd get on one! They do sound a little like hot air balloons except for a motor and I guess a better steering system. Sounds like it might be hard to read in some ways. Some times I am fascinated by historical disasters, sometimes I can't read them. historical disasters like this amaze me, it shows the perseverance of the human spirit! Wow! All you had to say was it was from Sleeping Bear Press and I was hooked! I have chills from watching the video. Reminds me of watching the plane crash into the Twin Towers live on morning tv. Just the disbelief and stunned sound in the announcers voices. We watched a show about the Hindenberg once. It might have been Mythbusters but I don't remember. They did a bunch of experiments trying to conclude what caused the fire. Something about chemicals in the paint that coated everything combined with the gas. Chills. Thank you for sharing the video and book. I want to know more now.